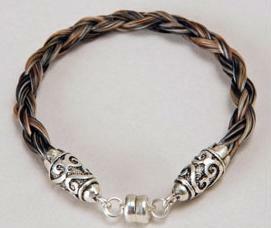 If you or someone you know is devoted to their horse, a bracelet made from that horse's hair is a perfect gift. All day, everyday, you can look at your wrist and be reminded of that special horse in your life, keeping them close to you at all times. Check the internet for stores who offer bracelets in a wide price range with several different options for the end caps and clasps. As a memorial for a horse who's passed over the Rainbow Bridge, or even one who is still with us, these bracelets are beautiful. It will be a gift that brings tears of joy to her eyes, young or old. Join in and write your own page! It's easy to do. How? Simply click here to return to Cool Ideas for Horse Lovers Gifts.